This is the Chamber of Commerce House on Highfield Road in Edgbaston. 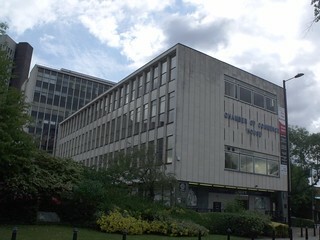 On the north corner with Harborne Road the Birmingham Chamber of Commerce, by Madin, 1959-60. Edgbaston's first tall post-war building. Four-storey block for the Chamber itself. Recessed ground floor with green Serpentino marble piers and blue and grey facings. Mullions of cream Travertine with Serpentino fillets. The west end cleverly disguises differing floor heights. Linked by a bridge, infilled by Associated Architects, 1996, to a simpler eight-storey block with aluminium mullions and a framing Travertine band, forming a T shape. The foyer retains a John Piper mosaic: bright greens, yellows and oranges on a background of black and dark green with a little blue. Rough-textured finish with gloss-fired tiles set proud. An urban landscape, perhaps, with tall towers. The shop on the ground floor is Vijay's. They have clothes made by Versace, Armani, Boss, D & G etc.